Why do we make a gauge swatch when we knit? Well, in the words of knitwear designer, author, teacher and Trendsetter Yarns company owner, Barry Klein, "If you don't swatch, you get what you deserve if your garment doesn't fit." 'Nuff said? 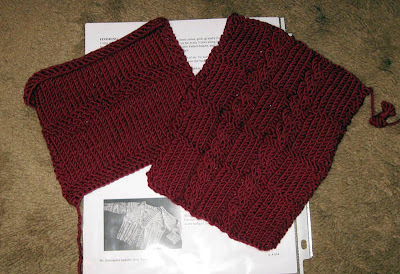 Stockinette and cable pattern swatches for my First Sweater knitting workshop. After taking body and Favorite Sweater measurements in our first class session, my First Sweater workshop students are busy knitting swatches this week in preparation for the long anticipated sweater cast-on. The pattern, Mr. Greenjeans by Amy Swenson, calls for two swatches—one in stockinette for the main portion of the sweater, and the other in a cable rib pattern that is used on the cuffs and lower bodice. 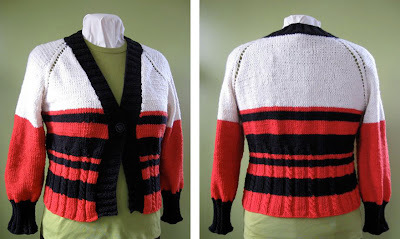 Workshop project: the Mr. Greenjeans raglan cardigan in Fibra Natura Sensational. We're using Fibra Natura Sensational superwash yarn for the project. The colors they all chose are gorgeous. After a "Pattern vs. Me" assessment in our next session, we'll begin.